Ono K, Hasegawa K, Naiki H, Yamada M. J Neurosci Res. 2004 Mar 15;75(6):742-50. Kanazawa University Graduate School of Medical Science, Kanazawa, Japan. Inhibition of the accumulation of amyloid beta-peptide (Abeta) and the formation of beta-amyloid fibrils (fAbeta) from Abeta, as well as the destabilization of preformed fAbeta in the central nervous system, would be attractive therapeutic targets for the treatment of Alzheimer’s disease (AD). We reported previously that nordihydroguaiaretic acid (NDGA) and wine-related polyphenols inhibit fAbeta formation from Abeta(1-40) and Abeta(1-42) and destabilize preformed fAbeta(1-40) and fAbeta(1-42) dose-dependently in vitro. Using fluorescence spectroscopic analysis with thioflavin T and electron microscopic studies, we examined the effects of curcumin (Cur) and rosmarinic acid (RA) on the formation, extension, and destabilization of fAbeta(1-40) and fAbeta(1-42) at pH 7.5 at 37 degrees C in vitro. We next compared the anti-amyloidogenic activities of Cur and RA with NDGA. Cur and RA dose-dependently inhibited fAbeta formation from Abeta(1-40) and Abeta(1-42), as well as their extension. In addition, they dose-dependently destabilized preformed fAbetas. 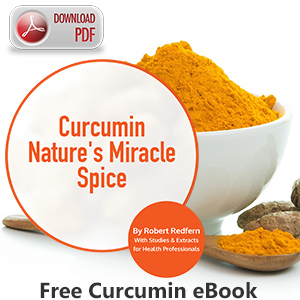 The overall activities of Curcumin, RA, and NDGA were similar. The effective concentrations (EC(50)) of Curcumin, RA, and NDGA for the formation, extension, and destabilization of fAbetas were in the order of 0.1-1 microM. Although the mechanism by which Curcumin and RA inhibit fAbeta formation from Abeta and destabilize preformed fAbeta in vitro remains unclear, they could be a key molecule for the development of therapeutics for AD.